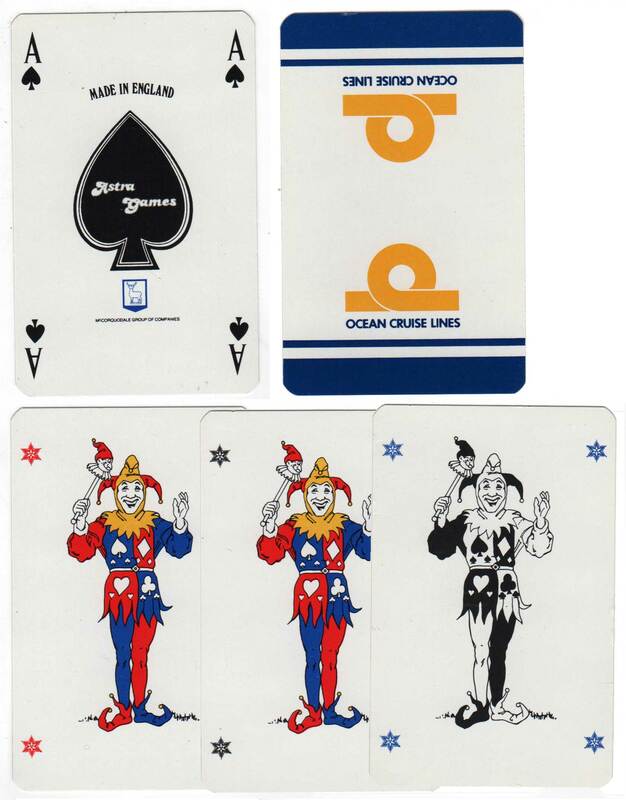 Astra Games was a subsidiary of the McCorquodale Group of Companies, producing standard advertising playing cards and cards for casino use during the period 1982-87. 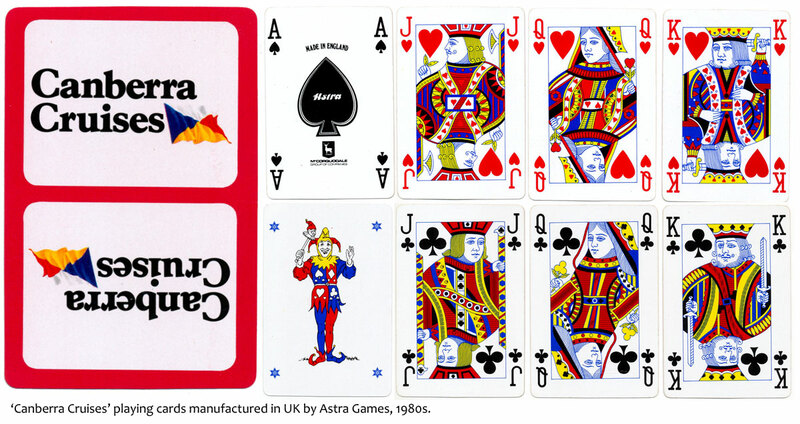 The Astra Games court card designs are inspired by those of Fournier, with one or two idiosyncrasies. 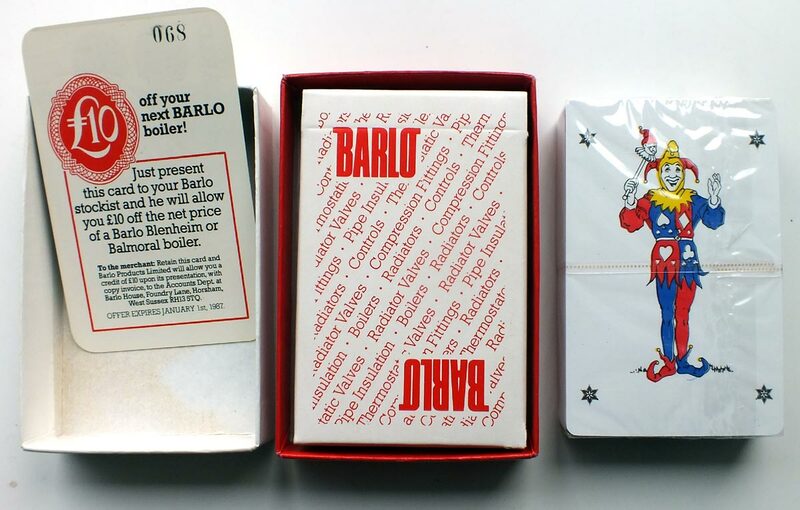 In particular, the King of Hearts has two left hands and the King of Clubs lacks the traditional orb. There are several small variations in the lettering found on the Ace of Spades and two types of indices. 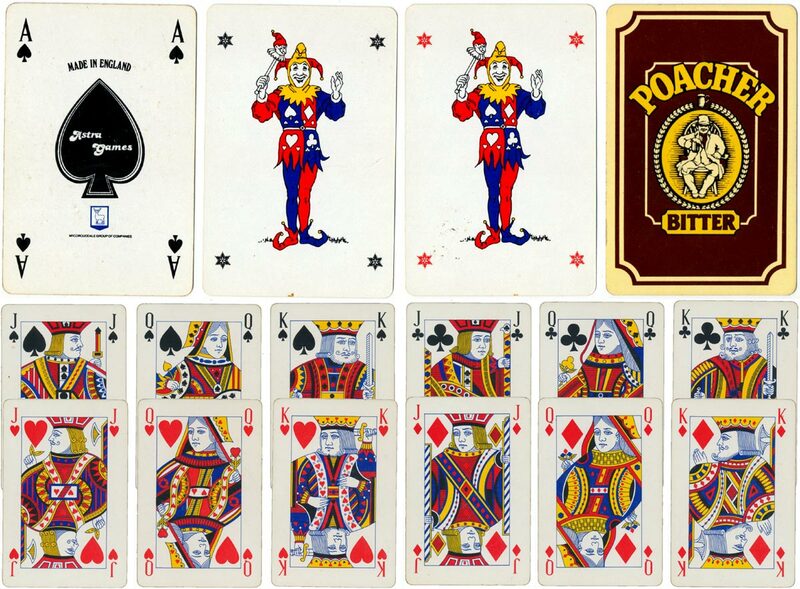 The standing jokers usually have snowflakes in the corners and the Contract Bridge score cards come with or without black borders. 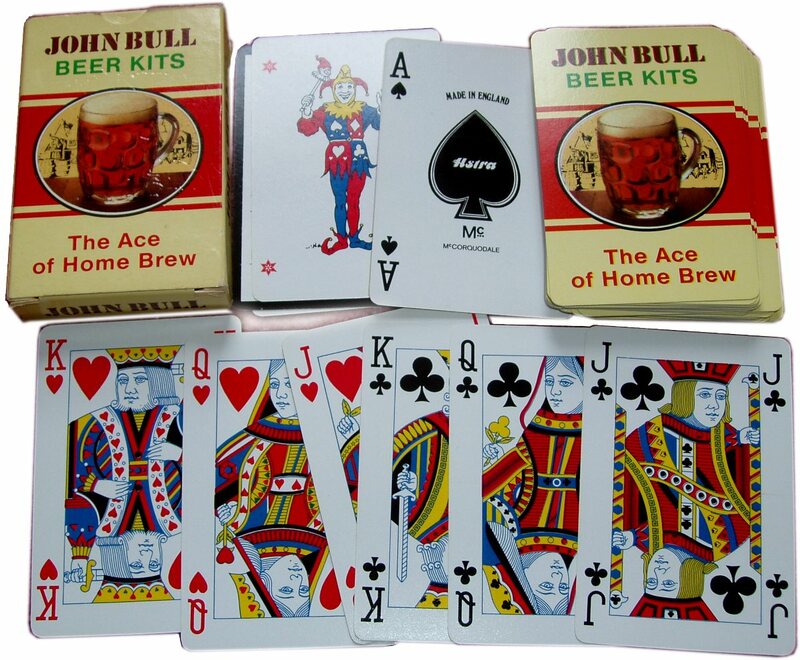 The cards have distinctively bright colours, shiny surfaces and are not linen grained. 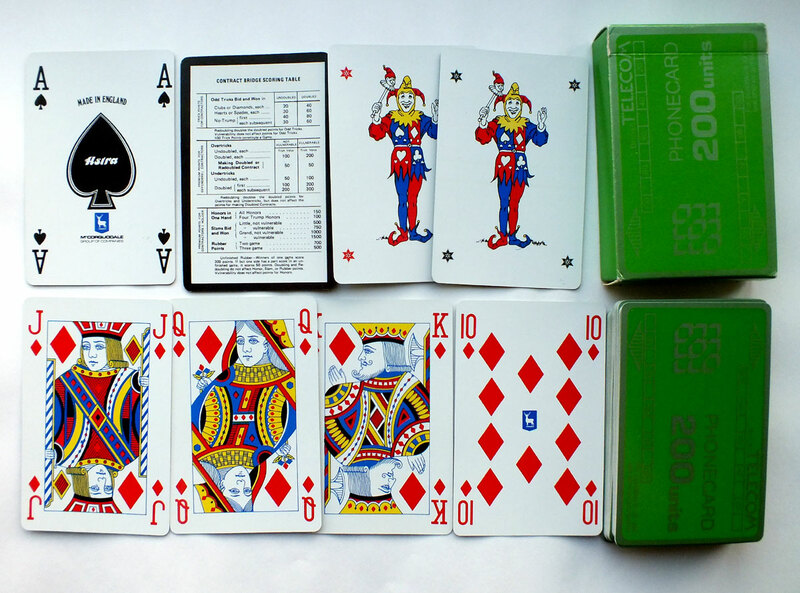 Above: typical Astra Games Ace of Spades, Joker & standard court cards. The cards have four indices. In some cases the blue shield on the Ace of Spades is black/white only or completely absent. 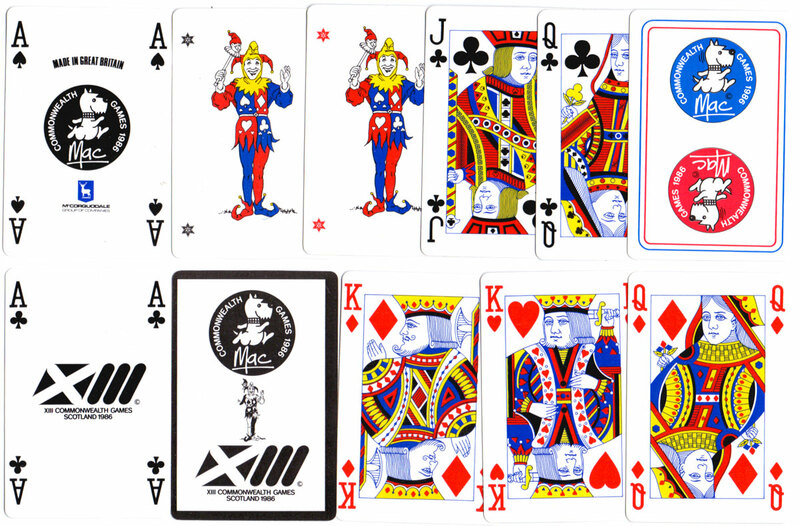 Above: special Ace of Spades and extra cards for the XIII Commonwealth Games, 1986. In other respects the pack is perfectly standard. Packs known to have been produced include: British Telecom Phonecards, Canberra Cruises, Suprega Hand Cleanser, Barlo Boilers, Hilti Power Tools, The Mary Rose Trust, Gramoxone 100 Weed Killer, KCA Drilling, L.P.H. Plant Hire, Watford F.C., Ipswich Town Football Club, Everton F.C., Plymouth Argyle F.C., Sheffield United F.C., Levi's Menswear, The National Trust, The National Trust for Scotland, Newey & Eyre, Ocean Cruise Lines, British Airways Poundstretcher, Wilkinson Sword, Liebert International, Fusilade, Coopers Filters, John Bull Beer Kits, Whitbread Poacher Bitter, Guernsey Holidays, The XIII Commonwealth Games & Alfred Marks Recruitment Consultants. Many more are certain to have been made. 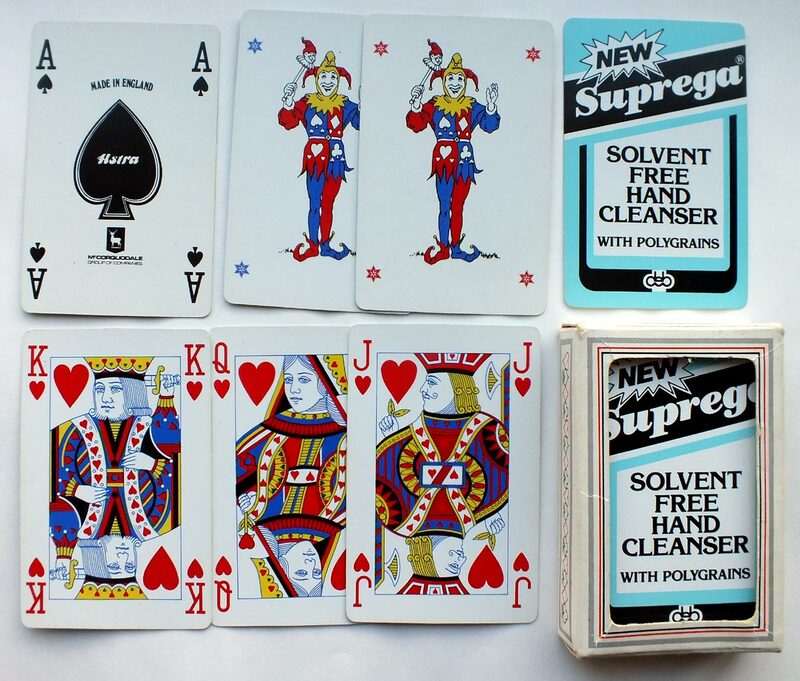 McCorquodale discontinued their playing card subsidiary in 1987, ostensibly for 'technical reasons' in that this was not their primary speciality. 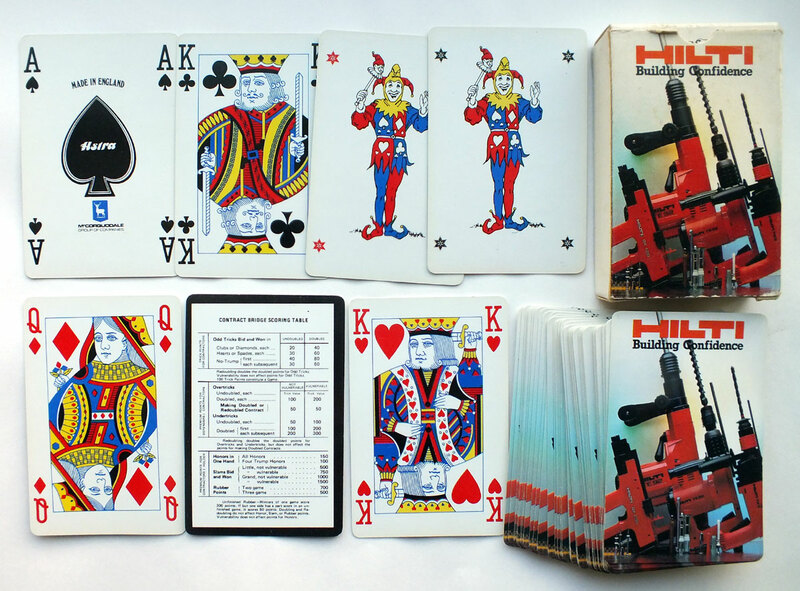 Woodpecker Press is believed to have started up in 1987 as a spin-off from the closure of Astra Games, and continued producing advertising playing cards of a very similar design and quality until around 1989. McCorquodale Card Technology (UK) was acquired in 1993 by De La Rue. In 1995 De La Rue, with its eyes on the move from magnetic strip to microprocessor cards, acquired McCorquodale Security Cards Inc. (MSCI) based in Pennsylvania, USA. 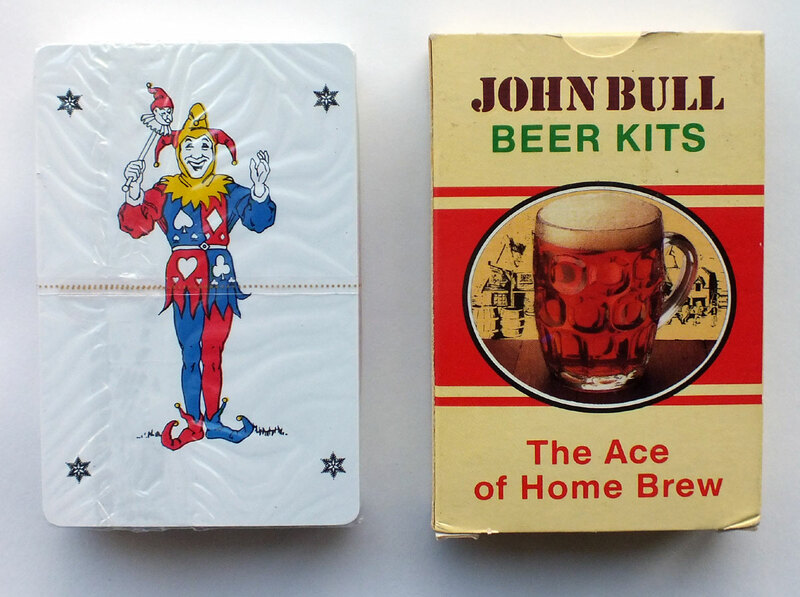 However, there was no return to playing-card production at this time.